Vital Health Saunas Review - Are They Worth Buying? Vital Health Saunas have been around for about 10 years, so it's a relatively new company compared to some of the others like Clearlight and Sunlighten. Still, they have been slowly making a name for themselves, providing a wide selection of far infrared and full spectrum saunas. The company is based in San Diego, California, and prides themselves on high quality construction, low ELF levels and superior customer service. Vital Health Saunas come in two wood options: red cedar and hemlock, two durable soft woods that are the ideal choices when it comes to saunas. You can choose from 1 person up to 5 person units, in just Far Infrared or Full Spectrum, meaning all three wavelengths: near IR, mid IR and far IR. The Red Cedar saunas carry the Elite name, and the Hemlock saunas are called Premier. Depending on which type you choose, you get the company's Vital Ray GEN IV Low EMF far infrared heater made with state of the art Japanese technology, and/or the VR1 300W full spectrum glass heater. One of the unique approaches that you won't find elsewhere is the inclusion of Magnetic Flux Therapy in all of their far infrared and full spectrum saunas. There are bi-polar magnets in the backrest, bench and floorboard to provide additional healing benefits such as pain relief and increased circulation. So you have a nice selection of high quality infrared saunas with advanced heating technology and additional healing components. There are a lot of good things happening over at Vital Saunas, and we can see how the company has grown in popularity. For starters, the owner Greg Baumgartner, seems to stand behind his product, and is concerned about the quality of his saunas and the efficacy of its heaters to maximize health benefits. The site has a nice series of videos showing you what to look for and what to avoid when it comes to buying a saunas. The company's manufacturing facility operates under high standards and holds all of the necessary safety standards. Vital Saunas uses non toxic woods, water based glues, organic carbon panels and powerful glass full spectrum heaters. There is an 800 number that you can call and speak to a live person, something that you don't always find with sauna companies. Oftentimes they just have a sales line, and the person taking the order is simply a rep who is not necessarily well versed in the product line or the company. Vital Saunas maintains an A+ BBB rating, which is as good as it gets and always a very good sign. 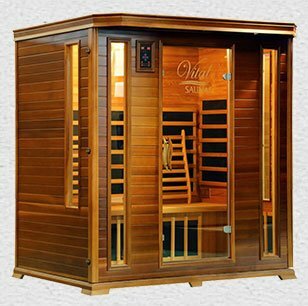 There are about 30 customer reviews in the system and all are quite positive about their experiences with the company and the saunas that they have purchased. The company focuses on the therapeutic experience rather than the bells and whistles like some of the other sauna companies out there do. Heating units are placed all around you, providing full body penetration. For example, their 2 person unit has 10 separate heating units. The benches are purposely flat rather than curved or reclining to maximize heat exposure. Glass is kept to a minimum as it is a poor conductor of heat, and they only include necessary components like reading lights and chromotherapy inside. As we mentioned, Vital Saunas has all of the necessary certifications, including the CE mark, RoHS, ETl and ETL-C and ISO. They one of the few companies that offers lifetime warranties on all of their saunas, another key benefit. They also post their prices right on the website, something rare in the industry. We didn't come across many cons during our Vital Saunas review, as the company doesn't fall short in any particular category. We didn't find any actual testing information like we found on some of the top brand sites we recommend, such as Sunlighten, but that doesn't mean they haven't had testing done on their saunas. The feedback we have received thus far from people who have purchased a Vital Sauna has been positive, so there are no issues to report and no bad experiences. Vital Saunas stands out as one of the few companies that actually takes pride in not only the quality of their saunas but also the health benefits that they provide to their customers. The owner stands behind his product and it's backed by a very strong warranty, a rarity in this industry. Time will tell if we are able to add Vital Saunas to our Top Infrared Saunas list, as we are awaiting more information and customer feedback, but for now they seem like a very good choice for your home. Take a look at their offerings and decide if you like what they have to offer. If you have any questions you can always call them up or live chat as their customer service is quite knowledgeable.